The Ottawa Senators clinched second place in the Atlantic Division and home-ice advantage in the first round of the Eastern Conference playoffs with a 3-1 win over the New York Rangers on Saturday. The Rangers managed only 19 shots in a game that featured few memorable chances by either team. Chris Kreider got his second career hat trick, J.T. 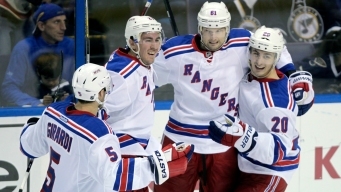 Miller added two goals and the New York Rangers beat the Colorado Avalanche 6-2 on Saturday night. 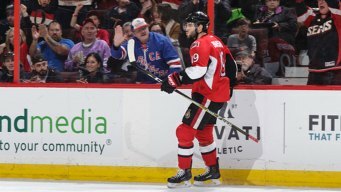 Nick Holden scored 55 seconds into overtime, Antti Raanta made 26 saves against his former team and the New York Rangers beat the Chicago Blackhawks 1-0 on Friday night. Kevin Hayes scored a power-play goal with 1:09 left in the third period to lift the Rangers to a 2-1 victory over the Winnipeg Jets on Thursday night. 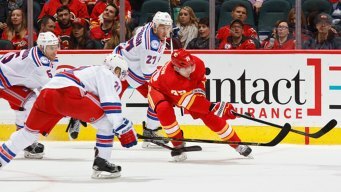 The New York Rangers beat the Calgary Flames 4-1 in Canada. 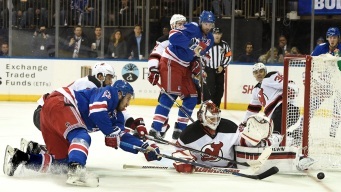 Henrik Lundqvist stopped 35 shots in the high-scoring Saturday night win. Rick Nash was unaware of his impressive numbers against the Blues before Thursday night's season opener. 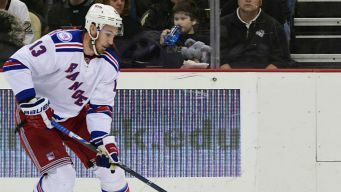 Derek Stepan, Martin St. Louis, Dan Girardi and Dan Carcillo scored goals, leading the Rangers to a 4-1 win over the Philadelphia Flyers in Game 3 on Tuesday night. 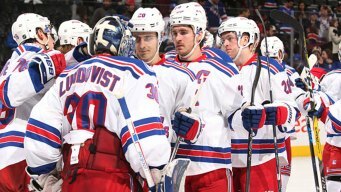 Get scores, analysis and updates on the Eastern Conference-leading Rangers, the pride of Madison Square Garden.